DEFIANCE is the original name for Glenwood Springs, Colorado where this Classic D110 Edition will make its home. The town is perfectly placed for Defender adventures, nestled between the narrow mountain valleys at the confluence of the Colorado and Roaring Fork Rivers. In Keswick Green with Chawton White roof and matching steels, the iconic image of the classic Defender will endure, as this station wagon boldly conquers the steep contours of the Rocky Mountain trails. This Defender 110 will be the perfect vehicle for the mountains of Colorado! 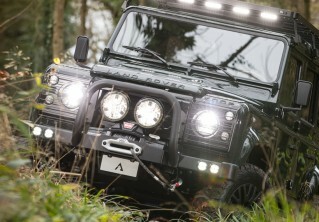 Check out DEFIANCE D110 Edition here or contact us for more information.